A couple of weeks ago I posted a recipe for Huevos Rancheros and included my recipe for red chile sauce. 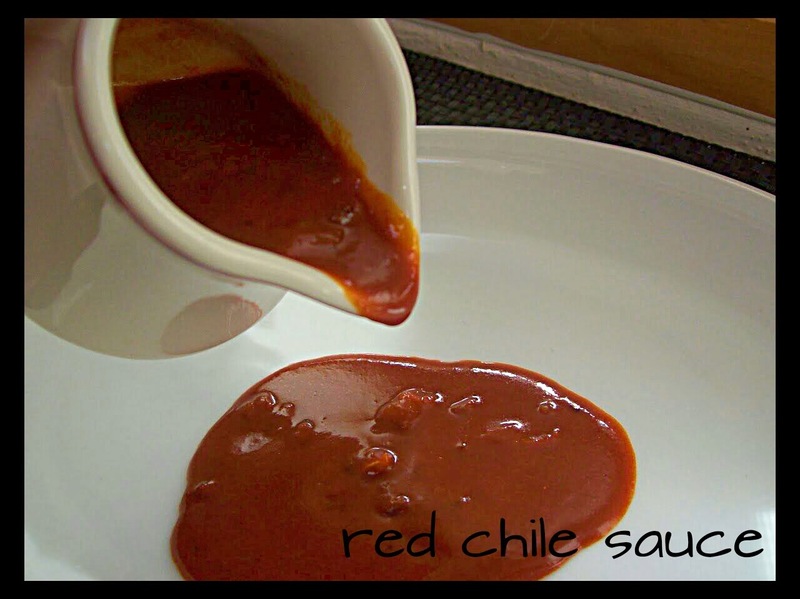 I always double or triple the recipe when I make the sauce because I use red chile sauce in many, many dishes. My favorite is enchiladas. And, since it is casserole week at Food Network's Comfort Food Feast, it is the perfect time to share my favorite enchilada recipe. In New Mexico, enchiladas are served "stacked"...not rolled the way they are prepared in Mexican cuisine. I don't notice a difference in taste but...man!...this version is so easy!! This has become my "go to" dish when I have a large group of people to feed. The stacked enchiladas, plus pinto beans, posole and a green salad create a simple and delicious menu for any size dinner party. Preheat oven to 350 degrees. Add the olive oil to a 2.2 qt casserole dish. Use a paper towel or pastry brush to coat the dish with the oil. Pour 1 cup sauce into the bottom of the prepared dish and spread to cover. Use 4 tortillas to cover the sauce. Take 1 additional tortilla, tear in half, and the tear 1 half into 3 pieces. Use the pieces to cover up any gaps where sauce is showing. Sprinkle 1/3 of the cheese over the tortillas. Sprinkle 1/2 of the onions and 1/2 of the scallions over the cheese. Repeat with remaining tortillas, another cup of sauce, another 1/3 of the cheese and the onions and scallions. Cover with the remaining sauce and the rest of the cheese. It is "Casserole" week at Comfort Food Feast roundup. Check out the other delicious sounding recipes from my blogger friends. Do you have a favorite casserole recipe? Share in the comments section. This looks delicious. Too spicy for my wimpy taste buds, but my husband would absolutely love it! We love spicy tex-mex and make our own chili sauce from dried chilies too, at least when I'm not too lazy. It is the best and really takes enchiladas up a notch. Enchiladas are definitely the best! The sauce gives a haunting cumin aroma while the heat from the chilies slowly tickle back your tongue. Anyway, I think it doesn’t matter whether you prefer red sauce or green sauce, since you’ll still end up with a tasty treat. I do hope you’ll be able to share more of your Mexican dishes in your future posts. Happy cooking!